If you have experienced a loss and need our white doves for the celebration of a life that was lost, know that you can find love and compassion and gentleness in holding our birds and truly experience what it feels like to “let go” and watch this beautiful white dove soar free above you and fly home. 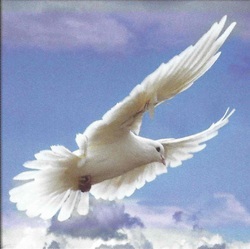 The release of white doves at a memorial service is a spiritual, uplifting and symbolic event. To watch a﻿ single ﻿white bird soar into the sky easily allows us to let our loved one go with the spirit of that dove. We offer special passages and readings to accompany the release. One dove symbolizing the spirit of your loved one displayed in a beautiful cage at the memorial or graveside. Three doves are released. Two doves symbolizing loved ones, who have passed, are released at the graveside or memorial service symbolizing the love that is waiting for them in heaven to then be joined by the spirit dove from a separate basket a few moments later. ​We also offer The Holy Trinity Release. This is just a sampling of the type of releases we offer. ​We serve Arlington National Cemetery. We do our best to provide for special circumstances and for our heroes. Please call to see what the doves and I are able to do. *Many families send our dove releases instead of flowers.